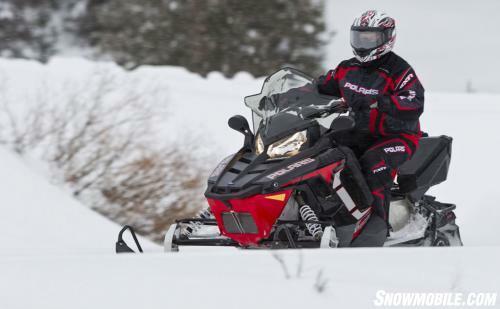 A decade ago, Polaris’ only crossover sport sled was its 700 SKS. That series was being faded out in favor of the more popular RMK series, which had earned a winning reputation in the mountain regions as the sled to have if you wanted to challenge steep hills and deep powder bowls. This past season Polaris recovered its reputation with its narrow nose, long tracked, 800 Cleanfire-engined Pro-RMK models. Add in the dual flavored Assaults, one for backcountry exploring and another for serious out of bounds trekking, and you have a snowmobile company setting itself up for success. 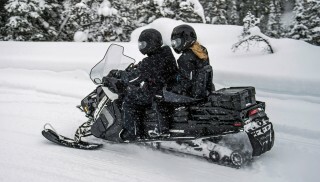 Success is exactly what Polaris snowmobile group general manager Scott Swenson proclaimed at a preview of the 2012 models. 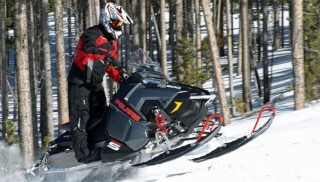 He noted that this past season, with early and frequent snow, resulted in excellent sales, “The best year in 10 years in snowmobile (sales).” He explained that the overall snowmobile industry was having its best year overall in a long time, with strong sales and dealer inventory shrinking to manageable levels. He claimed that Polaris had four of the top five best selling sleds, including exceptional performance by the new RMK, which he said was the sled of choice in the mountains this season. That will help explain the Polaris emphasis on powder and “adventure” type snowmobiles for the upcoming season. The bulk of the new-for-2012 models come with long tracks that range from the crossover segment to the serious powder runners. While there is “new” at the top, the traditional “value” sleds gain evolutionary enhancements and new graphic treatments. While the SKS nomenclature may have faded from the Polaris line, the concept has never been more alive under the Switchback nameplate. There are six of these models, led by the 800 Switchback Assault, the serious backcountry model that features a full 144-inch track and some heavy doses of RMK DNA. The other versions rely on a popular and proven 136-inch track length. 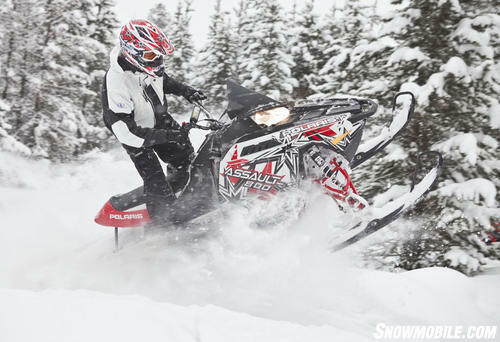 The 800cc Assault taps into a snowmobiler’s wild child. The Switchback showcases a revised Rush-type chassis that has seven-inch longer runningboards to give riders more active footing and to accommodate the lengthened Pro-Ride progressive rate rear suspension. This is the latest generation of the outside-the-skidframe suspension action first seen in the Rush two seasons before. It is designed to minimize those bone-jarring hits in deep moguls while bridging trail chatter and smoothing out niggling stutters. The Rush front end and power systems complete this new style Polaris crossover that the company says will satisfy those riders seeking both on-trail performance and off-trail capabilities. The new Switchback features a longer runningboard to accommodate active off-trail riding. 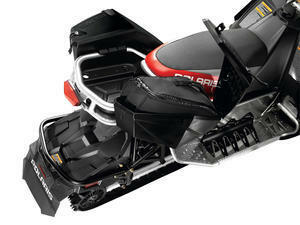 Polaris brings unique locking cargo gear to the serious snowmobile trail rider. While the stretch track rear suspension will be obvious, there is a not so subtle front-end refinement that comes directly from Polaris snocross racers. The new front suspension is virtually all new as it features revised spindles, control arms, control arm bushings and a new steering post. The result is said to be flatter, more precise cornering with reduced steering effort. The top line 800 uses exclusive to Polaris Walker Evans premium shocks to give serious off-trail riders the maximum in control. There will be Switchback versions in both 600 and 800 power choices. 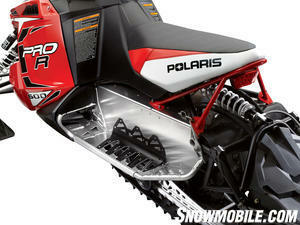 Built around the new Switchback platform is Polaris’ attempt to bring some motorcycling nuance to snowmobiling. Polaris defines its Switchback Adventure as “versatility without compromise,” basing the concept on the new breed of motorcycles that are potent off-roaders but equipped to carry more than a rucksack of adventure. To package your gear, Polaris outfitted this special Switchback-derived sled with an integrated “Lock & Ride” locking cargo system that includes a rear cargo rack and specially designed saddlebags. All pieces are designed to attach to the rack in seconds without tools. Durable fabric liners with zipper closures and grab handles mate with the side bags. Of course, carrying gear is one thing, but enjoying the ride is another. The new Adventure model offers wind deflectors, an available extra-wide tall windshield, electric start, Polaris Electronic Reverse System, accessory power outlets and mirrors. These are the top of the performance line for Switchback, but there are base models in both engine sizes as well. With a 136-inch stretch track and proven Rush ride, the new Adventure adds off-trail capability to a popular trail model. Joining the upgraded for 2012 800 RMK models is an equally serious, but 600cc powered series of rides. Like the more powerful 800s, the new 600 is designed to be light in weight, simple and “flickable” for quick and reliable riding in powder. 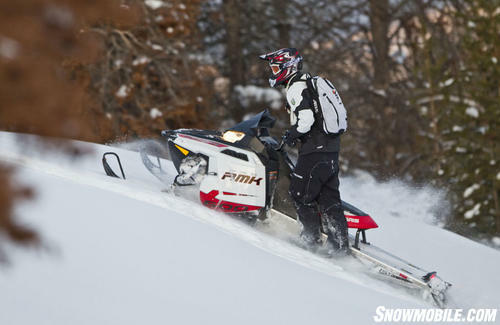 The 600 RMK comes with a 144-inch track, Switchback style seat and the real-deal RMK torsion-sprung rear suspension. Polaris claims the 600 Pro RMK will weigh in dry at around 431 pounds, making it well positioned as a sled for riders who prefer tree lines and bowls. Like the 800 version, the 600 Pro-RMK comes with Walker Evans gas shock packages. You have a choice of two track options — 144 or 155 — in the base 600 RMK line. The new 600 Pro-RMK is light and nimble and shares its powder DNA with the best-selling 800 Pro-RMK. There will be a hybrid RMK Assault based on the 155 track. It comes with Pro Taper handlebar and Walker Evans shocks. The top line powder muscle continues in the 800 Pro-RMK series with optional track length. You’ll have six powder choices in 2012, three with 600cc Cleanfire power and three with the popular 800cc Cleanfire twin. 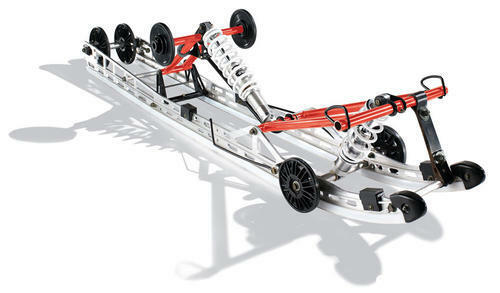 Light, simple and efficient, the RMK skid gets the Pro-RMK up on the snow easily. The remaining LX and LXT models enter 2012 with evolutionary and graphics updates. You’ll find turbo four-stroke and Cleanfire two-stroke engines powering both stretch track LX solo luxury rides and two-up LXT touring models. Polaris continues the Shift series, but they now come with their own graphic enhancements, rather than basic black. There are selections in short or long track. Highlighting Polaris on-trail performance continues to be the Rush series, led by the 800-engined Rush Pro-R LE, which will be available as an early order model only. There will be Rush models with a choice of 800cc or 600cc Cleanfire performance. Rounding out the Polaris line for 2012 is the utility segment of four-stroke or two-stroke powered WideTraks and the extra traction of the WideTrak LX destined for international use. Polaris kids can count on seeing the continuation of the popular 120 Pro-R with its diminutive four-stroke single and Pro-R styling.